Grunting: Usually the noise a mother pig makes when feeding her young. There are loud grunts and soft grunts. Each has a different meaning. Barking: A warning of danger nearby OR this can mean your pig is having fun. Squealing: A sign of anticipation (usually when about to be fed) or a sign of pain. A quiet, hot panting: Usually the pigs way of saying “hello” or being friendly, we interpret this as a pigs way of saying I love you. A rough coughing noise: Usually means your pig is annoyed about something. Quiet, continuous groinking: I’m totally content and probably rooting, sleeping or getting into something I shouldn't have. Breathy, in-out he hon he hon he hon: I know you and I’m pleased to see you, we believe this is a pigs way of saying "I love you"
Aroooooo- Means feed me NOW! Woof- It sounds like a bark. This has two meanings. Excited in a good way..... they will bark and run and play. If they say it in a higher pitch it means DANGER and they will run away. Rarararaa grumble grumble- Means I AM NOT moving off the couch! Lip smacking - Can merely mean they are enjoying their food, they have food stuck in their mouth or because they have so many tastebuds, they could very well be tasting the air as strange as that sounds (sometimes they will froth at the mouth). This usually means they are angry and ready to fight (with another animal) It can also mean they are ready to find a suitable mate (part of the mating ritual). This can also be a sign of aggression, but the aggressive sound is usually more chomping rather than lip smacking. Grunts - they have soooo many of these.... Most are happy grunts. They have different sounding ones that come with belly rubs...... when you get the "right spot", scratching, rubbing, petting or happy I-am-eating-food grunts. Some pig sounds you may hear. This is an example of a pig that is "barking" and it does sound much like a dog. Some pigs will "bark" when they're excited or running and playing. 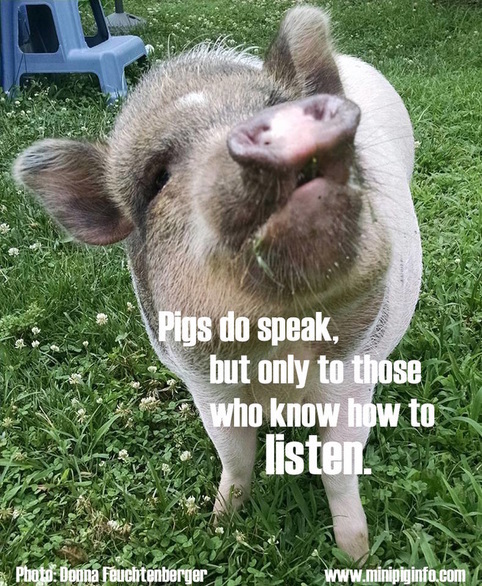 Other pigs will bark from fear, knowing the situation surrounding the sound can help you determine if its a happy sound or an unhappy sound your pig is making.